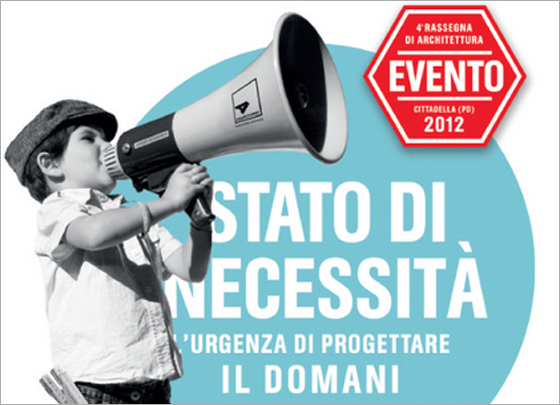 Tomas Ghisellini is among the 15 designers selected by "Architettando" Cultural Association for the IV National Exhibition of Architecture entitled "STATE OF NECESSITY - The urgent need to plan for tomorrow". The event will see the installation of a major exhibition in the halls of the Praetorian Palace of Cittadella (Padua), which will be open May 19 to June 1, 2012, and the publication of a prestigious paper catalog. The initiative, with the aim to promote reflection on the new season of architecture in Italy, the responsibilities of designers and the contribution of patrons, saw the candidacy of 170 projects.